Evan & Alex are participating in their 2nd (and final) intro-spiel in their quest to be part of the Canada Winter Games 2015 curling team. An intro-spiel means that this weekend is essentially a practice run for the bonspiels they will play later this winter, to determine which players will get to move on. The team playing this weekend, representing our team, played together for the first time yesterday due to circumstances beyond our control. They have been curling very well together, considering! The one thing I saw that made me really happy was the smiles, laughter, and sportsmanship being shown among the players on the ice, despite the way the games were going. That’s what is most important to us. Last night, the boys didn’t get off the ice until 11:00 p.m. They were cold and tired; clumsy, and a bit punchy. I noted, tongue-in-cheek to their coach that this is an instance when being parents who insist on a decent bedtime doesn’t do them any favours! Since we were driving back-and-forth, we didn’t arrive home from Antigonish last night until about 12:30 a.m. We made the decision today, to only go up for their morning game which started at 11:00. The boys had a sports psychology session this afternoon, and didn’t play again until 7:30 AST tonight, so we made the decision to come home and watch the score update online in (close to) real time. The link, if you catch this in time, and want to watch along with us, can be found here. Let’s hope they have some good curling in their last three games! 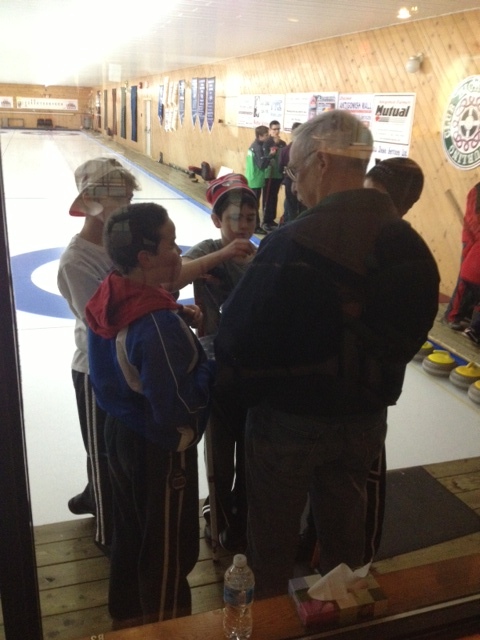 Team Rose, with their coach during a time-out after the 4th end. What do you get when you fill a church hall with a group of B&B owners? Stories! Lots & lots of stories! 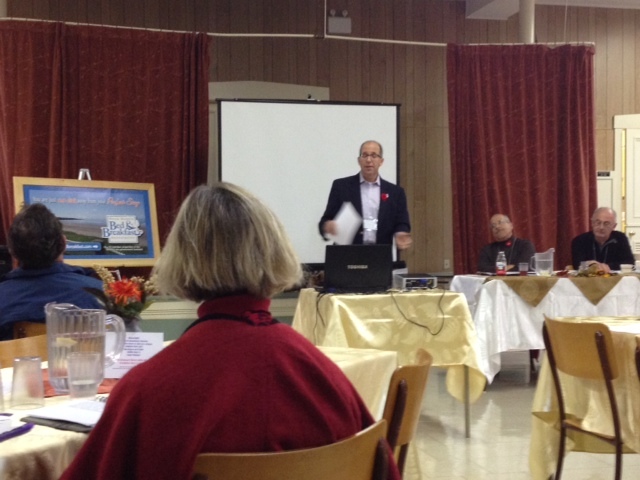 Yesterday, D’Arcy & I attended the annual general meeting of the Nova Scotia Bed & Breakfast Association. Each year, the meeting is held in a different part of the province, and this year, we gathered in beautiful Lunenburg, Nova Scotia. Because we’re both teaching in Pictou this year, we did not make it to Lunenburg yesterday for the B&B tours and social time, which is one of my favourite activities. Instead, we got up early in the morning and drove to the South Shore. It was a beautiful autumn day. We took the newspaper with us and did the crossword as we drove. It takes less than two hours to drive from Truro to Lunenburg and it was a smooth drive. When we arrived at the AGM, we had lots of time to get caught up with other B&B owners from around the province. It was great! As a rule, B&B operators love to visit, chat, and laugh- you can just imagine the volume when we all get together… The meeting ran smoothly and I enjoyed the opening presentation by Pat Sullivan, Chair of the new Nova Scotia Tourism Agency. I am looking forward to new ideas for tourism unfolding with his leadership. I appreciated the fact that he was realistic, down-to-earth, and approachable. Pat Sullivan of the Nova Scotia Tourism Agency addresses members of the Nova Scotia Bed & Breakfast Association in Lunenburg. 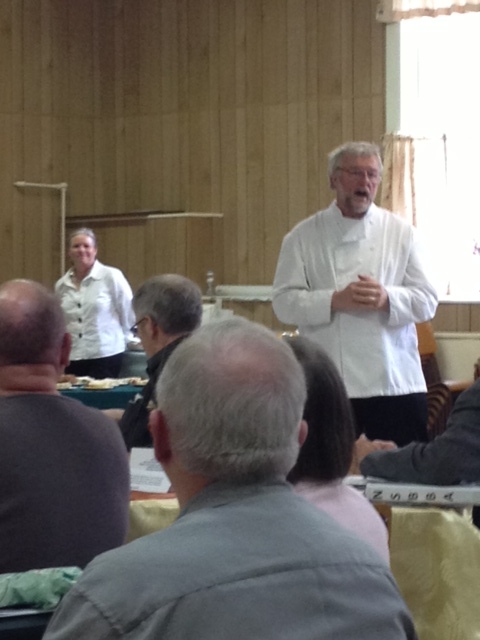 The food, provided by John & Tatiana, caterers in Lunenburg was homemade and so full of flavour. John even serenaded us over lunch with his version of “The Water is Wide”, promoting an upcoming concert on December 15th to aid the Lunenburg & Mahone Bay food banks. He cooks AND he sings! Just wonderful! Our meeting was led by out-going NSBBA president (and friend) Gerry Mailloux. He received two standing ovations in recognition for all the work he has done for the Nova Scotia Bed & Breakfast Association over the years. He & his wife, Ruth, have been running B&B’s and mentoring perspective innkeepers in the province since 1986. Gerry has been struggling with some health issues this year, so there were some moist eyes in the room as he read his President’s report. We laughed and carried on as people told funny (and not-as funny) stories about guests and experiences they’d had during the season. It was generally reported that numbers were up and more tourists were on the move again this summer. We swapped recipes and ideas and rejoiced in the announcement of “Baby No-Name (girl) Falkenham”, born to our TIANS Liason, Jennifer, just the day before. We made promises to one another to get together soon. Before we left Lunenburg to head back to Truro, we stopped to see the newly re-built and re-launched Bluenose II. 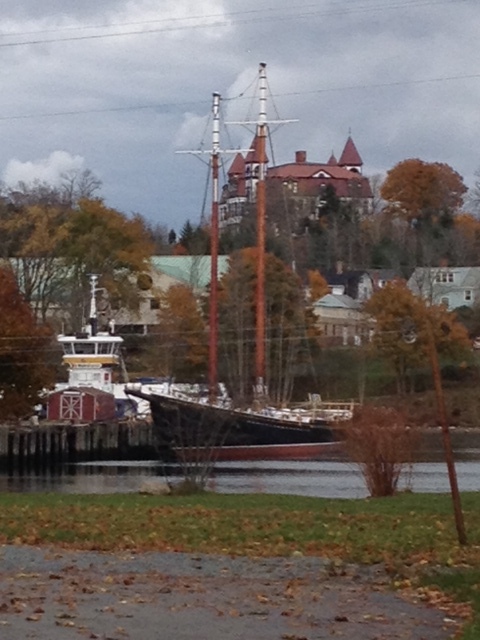 The newly re-built Bluenose II with Lunenburg Academy in the background. Our boys have been curling for a number of years now. They are on a team that are practicing with a goal to represent Nova Scotia in the 2015 Canada Games in Prince George, British Columbia. The girls have been dragged from club to club over the years, watching their brothers practice and compete while D’Arcy & I belong to a fun league on Mondays. 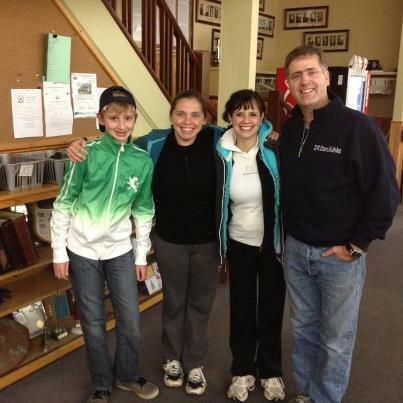 Last Monday, Evan joined our team to play as a “spare” for Jean-Claude – our normal team mate, who was away on business. 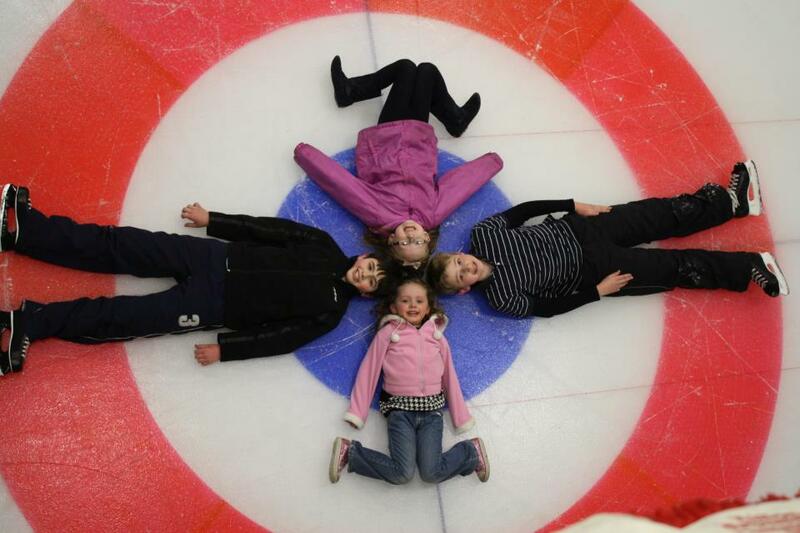 Our kids on the ice on the final day of curling last year. After the bonspeil was over, they were allowed to put on skates and have a different kind of fun! 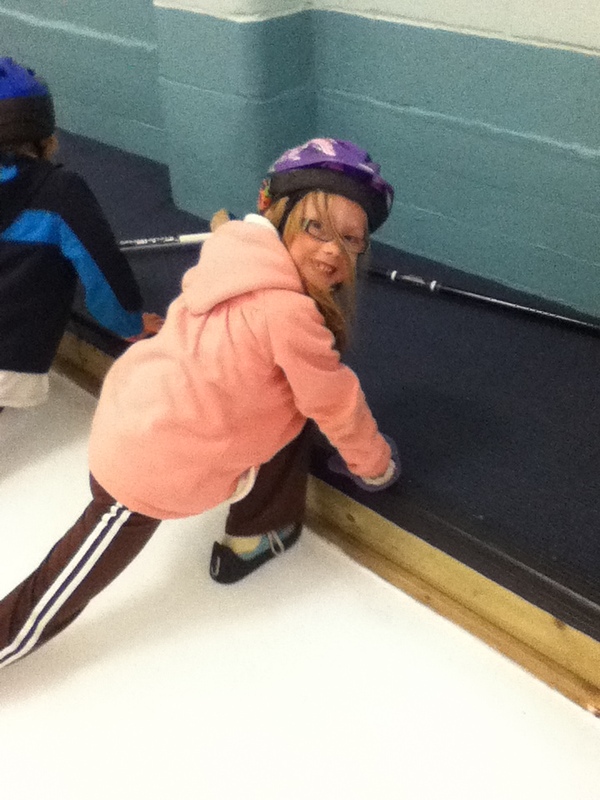 This Friday, it was finally the girls’ turn to get on the ice and slide. I think we have some more curlers on our hands!! 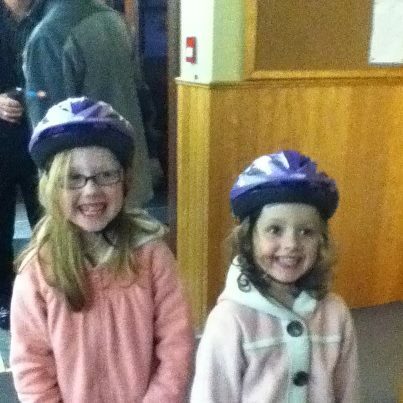 Sarah & Olivia were so excited to get on to the ice!